Dayboat insurance policies can be compared quickly with MoneyMaxim. Using our service we will introduce you to insurers who specialise in these craft, and you will be quickly able to both obtain quotes and compare features. What is a dayboat? It's a craft which has no sleeping accommodation - but can range from a motor cruiser, through RIBs to motorboats designed for sea fishing for the day. Whatever your boat we can find insurers who will do their utmost to find the right policy for you. Will you be using your dayboat very frequently? Some dayboat insurance policies take account of reduced claims if you are racing, particularly regarding claims for masts, spars, sails and sheets. Do you want cover for everything that you carry on board? Are you an experienced and adventurous seaman who is competent to take your boat abroad? 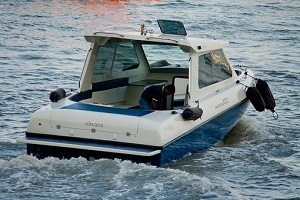 If so and your boat is suitable for cross channel travel european cover could be an option. If you think you might need cover in Europe, it will almost always be cheaper to find a policy offering it from the start rather than adding it part way through the year, when policy amendment fees will apply. Some dayboat insurance policies have age restrictions on the boats they cover. If you have a well loved dayboat make sure it will be covered by your chosen policy.